Peel and dice the eggs and place in a small mixing bowl. Add the mayonnaise and mustard and mix it up just until blended. Add a sprinkle of salt and dash of pepper (I like to use the salt/pepper grinders for a coarse seasoning). 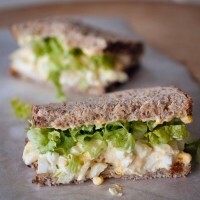 To assemble the egg salad sandwich, put a light layer of mayonnaise on one slice of the bread. Spread the egg salad mixture on the second piece of bread. Top the egg salad sandwich with crisp lettuce and the other piece of bread. Simply delicious – just like you said! I’ve enjoyed several of your recipes, Debbie, and love the way you expand on preparation instead of just listing ingredients. You’ve created a wonderful website and I look forward to trying many more of your recipes. Michelle, thank you for your comment and feedback! We’re always so happy to hear how the recipes work in the “real” world. So nice to have you part of our entertaining community.